James Gunn is Marvel Studios’ most effective filmmaker. Sure, other writer-directors have delivered exciting, interesting, energetic films, action and/or character-driven in purpose. Joss Whedon gave us the former in The Avengers, just about finding enough room to squeeze so many overblown personalities in amongst the blast-and-ruin spectacle. Anthony and Joe Russo’s work on the Captain America arc has been a triumph as far as affording the seemingly ungroundable genre some grounding. But you get the feeling Gunn, more than anybody else, has an affinity for his characters. And in a cinematic bullpen dominated by flash and awe and all that jazz, these films need to provide adequate space for genuine character moments. It helps that Gunn has a bunch of game, off-piste actors at his disposal. A bonafide A-lister in voice only. Another not just in voice only, but limited to three words. A former comedy sitcom goof. An underused performer whose mainstream exploits have placed her second or third fiddle to her male co-stars. A wrestler rarely heralded for his acting abilities (until he became a thoroughly entertaining bad guy). And Michael Rooker. It helps, too, that these are people who clearly get along in real life. They look cool in group promo shots, are funny in group promo interviews, and combine the two in group promo selfies. Whereas The Avengers are big-time charming, this lot are ragtag charming, and their performances reflect that — aloofness and competence in bundles. There are three show-stealers, each of whom assume varying levels of prominence throughout the film. Dave Bautista is the comedic heartbeat of a generally funny picture, a primary player as Drax the Destroyer, whose battle to overcome tone-deafness invites instances of hilarity. Bautista, by the way, is one heck of a catch for Hollywood. Next to him, as Yondu, the aforementioned Rooker recounts the surprising emotional verve he once deployed as Merle in The Walking Dead. Both Merle and Yondu are unlikeable antagonists, but antagonists who discreetly command a sense of attachment from viewers. 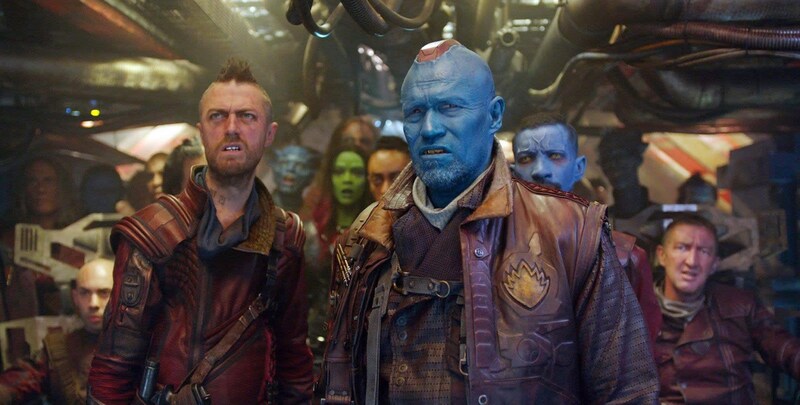 Perhaps the real heartbeat of the piece is Sean Gunn as Kraglin, second-in-command to Yondu, a miscreant with a conscience. Gunn, who also stop-motioned as Rocket during filming, makes the most of the screen time he receives, packing as much punch as those hogging the minutes. The plot itself is straightforward. 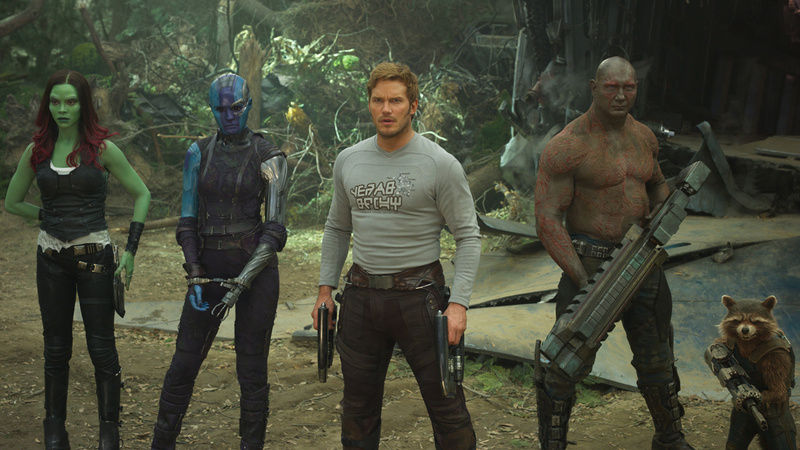 The Guardians — Drax, Peter Quill (Chris Pratt), Gamora (Zoe Saldana), Rocket (Bradley Cooper), and Baby Groot (Vin Diesel) — hightail it across the Galaxy in an effort to hide from the Sovereign, a robotic alien race led by Elizabeth Debicki’s Ayesha. The story, though, is one that incorporates fatherhood and sisterhood, told without narrative complexity but still thoroughly engaging. As a director should, Gunn relies on his cast and crew to bring his vision together, and his vision is colourful. Henry Braham’s gloomy work on The Legend of Tarzan is nowhere to be seen: Given its infinite parameters, it makes sense that space would breed so many vibrant and distinctive civilisations and peoples. The wild accessorisation of The Hunger Games springs to mind, as does The Fifth Element’s aesthetic mania. And I have to point out a landscape shot fraught with tangerine beauty and instantaneous threat, the latter via a spacecraft that advances so rapidly you hardly have time to admire the Braham’s photography. This willingness to just accept the absurdity is alluring. Gunn is not trying to sell us something false, therefore the oddities are easy to buy — a Kingsman-esque murder slalom made jovial via euphoric music — and subsequently digest. We even get some stoner comedy in the midst of too many inter-dimensional space warps, a throwback to the filmmaker’s work on the Scooby-Doo live-action series. And, though infrequent, the piece knows when to harden the mood, often at the behest of Quill’s father-finding arc opposite Kurt Russell, who seems to be having a great time hamming it up as a god. Karen Gillan also does solid work as Gamora’s intensely pained sibling Nebula, though her story could do with some more fleshing out. Some of the conventional superhero traits do find their way into the piece: The general lack of true jeopardy; the special effects-fest towards the end. Although it isn’t a huge distance, this is as far from the Marvel formula as we are likely to get, Taika Waititi’s Thor: Ragnarok pending. Put it this way: Whereas the iconic Avengers gladiatorial pose (that bit where they all assemble mid-battle and the camera gives us a 360° shot of their scarred triumphs) is a pristine effort, akin to a collection of futuristic Atlas sculptures, the same pose here ends with an amusing splat. Guardians of the Galaxy Vol. 2 isn’t after glamour. It is after fun, funny and feeling, and it nails all three. I really wanted to love this film but I did not connect with it at all! You are right that it is not using the typical Marvel formula but its story arc is uncomfortably very close to the first one as the team is torn apart and then reminded of why they worked so well in the first place. And the way they are all able to survive almost anything unless it serves the story was probkematic – this is not the only superhero movie to have that problem but it went to the invincibility well way too often for my liking. That’s fair. I guess I just buy into the madness. It’s definitely an issue that there’s never really a sense of jeopardy. A little too long, but still enjoyable. Nice review Adam.